You’ve been blogging for a year, perhaps more, and would like to have something you can share with a whole new audience. Maybe you’re like John Scalzi or Noah Lukeman and want to compile a book of all your articles, short stories, and writing advice. This week I’ll show you how, without having to copy and paste every blog post for the last year. You’ll learn how to use WordPress’ XML export function, how to convert that raw data into an HTML webpage which you can edit and convert into an eBook you can sell on Amazon, or anywhere. Today we’ll focus on getting all the tools you’ll need. Don’t worry everything’s free 🙂 and not too terribly complicated. Notepad++ is a little more than a text editor. In addition to recognizing a wide variety of programming languages, Notepad++ has a number of plugins which can be used for anything from text-to-speech to XML Parsing. The hardest part of converting your blog to an eBook is parsing WordPress’ export file into something useful, but with XML Tools you can take only the things you need from the file and convert it to something you can work with in Word. a. 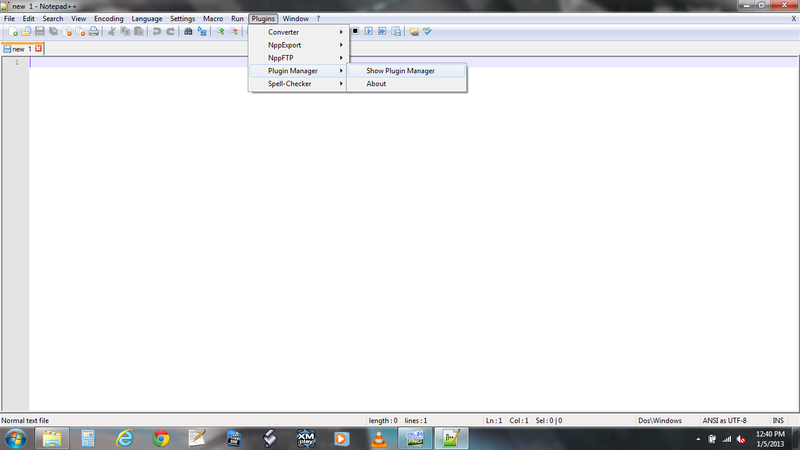 Open up Notepad++ and select “Plugins–>Plugin Manager–>Show Plugin Manager“. b. This will give you a huge list of all the available plugins. The one we want is at the bottom. On the “Available” tab, scroll to XML Tools, and check the box next to it. Click “Install” to begin the installation process. 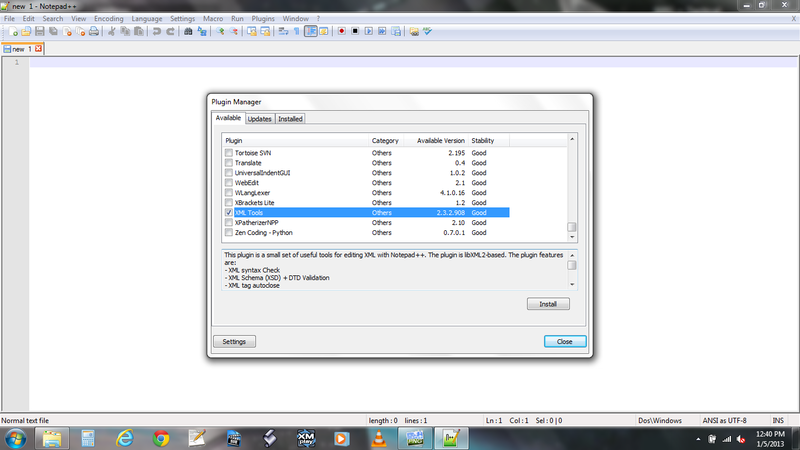 c. Notepad++ will download the plugin (you’ll see a screen like the one below), and then install it. 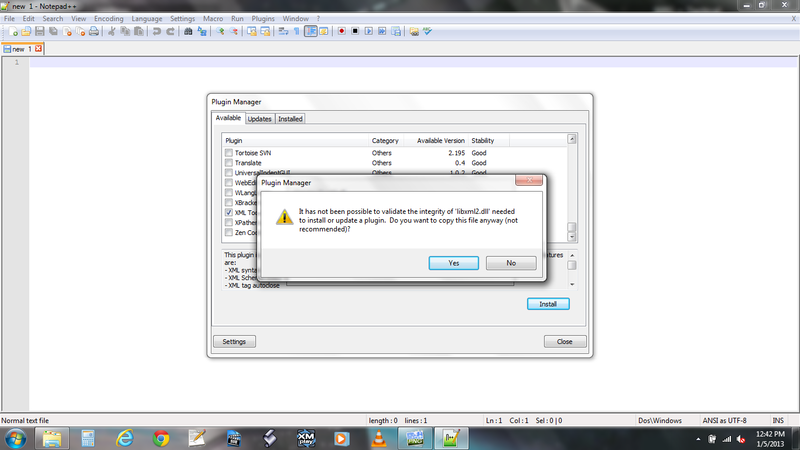 d. You may get a warning about Notepad++ not being able to verify the integrity of a plugin. (Issues standard disclaimer here) I have not had any problem with clicking “Yes” to this option, and it is required in order to get XML Tools to work. My suspicion is that Notepad++ has unusually strict verification procedures, and that there is nothing functionally wrong with the DLL, as both Notepad++ and the plugin function normally after installation. If you’re worried about it, use the portable version of Notepad++, which installs nothing in your computer’s registry and should keep everything safe. 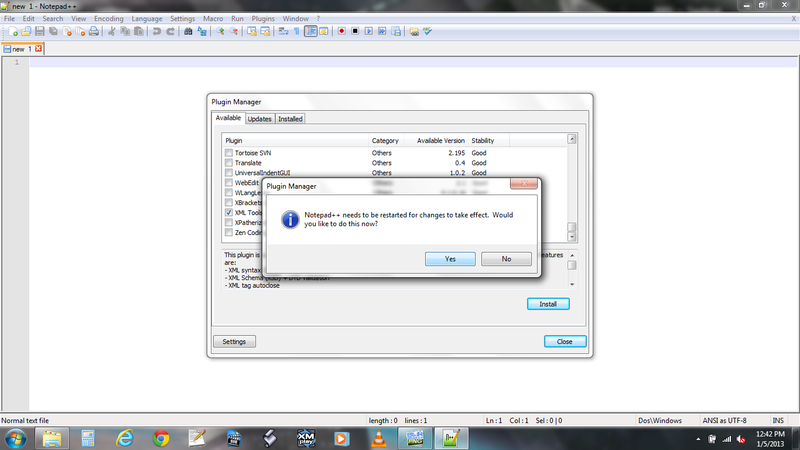 e. Notepad++ will ask to be restarted when it is finished installing the plugin. Click “Yes” and Notepad++ should pop back up in a moment. 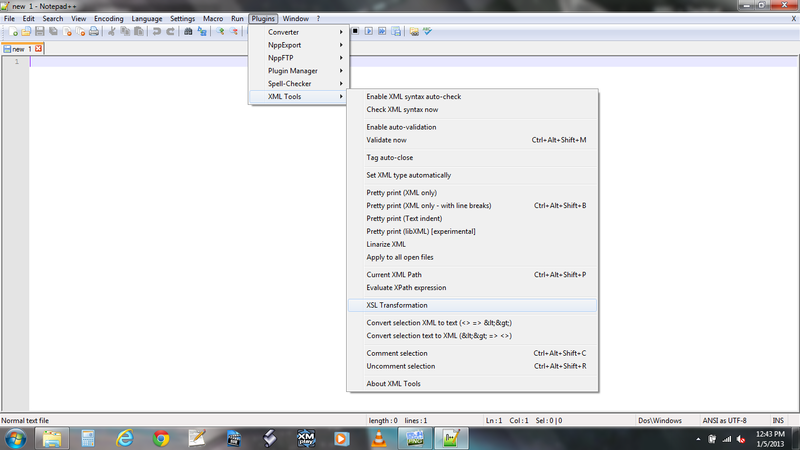 f. Your XML Tools are installed to the plugins Menu, usually at the bottom. To access them, select “Plugins–>XML Tools” and you’ll see a menu like the one pictured below. The only one you’ll need for this project is “XSL Transformation“, which is toward the bottom. XnView is a free photo editing tool. You can use it to apply filters, crop and resize images, convert images between a wide range of formats, and for our purposes handle batch operations. Rather than having to shrink each image file individually, we’ll use XnView to apply a set of operations to a large group of pictures. We’ll need this for when we’re getting your blog pictures ready for the eBook format. Calibre is an eBook library management / conversion tool which can handle most eBook formats. This is what we’ll use to create our eBook in the MOBI, EPUB or other eBook types. Calibre can synchronize with eReaders, and android tablets using reader apps to transfer books back and forth to devices. When you start up Calibre for the first time it will ask you what sort of device you have. I’ve used the Kindle Touch, Fire, and Android Tablet with Kindle options and they’ve all worked fine. Calibre does not restrict to a single device, and seems to have a reasonable ability to detect different devices that are plugged in. The only reason for this device selection seems to be the default output format. You’ll also need Microsoft Word or an equivalent word processor. I’m using Word 2007. That’s it, you have all the tools you need to start on this blog to eBook conversion adventure. Next post, I’ll show you how to export the WordPress file and convert it to a webpage. Any questions\problems so far? Thank you for sharing. I look forward to the next installment. Hope you enjoyed the full week and that they were helpful. Thanks for stopping by! Great to have all this for reference. Thanks! Hi Ben, Just tried to download Notepad, but it appears to only work in Windows. Do you know of a comparable program for Mac? Not off the top of my head (I don’t own a mac 😦 ). I’m sure there are other XSL transformation programs available for the mac, though the vast majority are written for linux (like ubuntu) or windows. If I come up with something I’ll let you know. Good web site you have got here.. It’s hard to find quality writing like yours nowadays. I really appreciate individuals like you! Take care!! Love the site and this article, but I must ask…can this work for WordPress.com or just WordPress.org? I’m not sure. I guess I’m using wordpress.com so I know it works there. If you or anyone else is using WordPress.org I’d be interested in feedback. Thanks Headphone Nation! Note to self: try this when I have some time….